The 1965 Watts Uprising left shattered lives, charred structures, and a bruised and wounded community in its wake. Long after those violent August days were over, families mourned loved ones who were killed and debris filled the streets. Artist Noah Purifoy collected that debris—three tons of it. Three tons of burnt wood, broken glass, and rusty nails. Three tons of detritus heavy with pain, scarred by brutality, and saturated in racial tension. Noah Purifoy, Watts Riot (1966), courtesy of the California African American Museum. Collection Friends, the Foundation of the California African American Museum. The sculptures that Purifoy created from that rubble are elegantly crafted works of fine art. In a museum, their shape and structures appear familiar—a rectangle hanging on a wall, a figurative sculpture, a totem. But look closer and the materials from which they are made speak volumes. Imbued with the physical remnants of a uniquely American brand of racial violence, their edges are rough and their faces and surfaces are smudged with black soot. 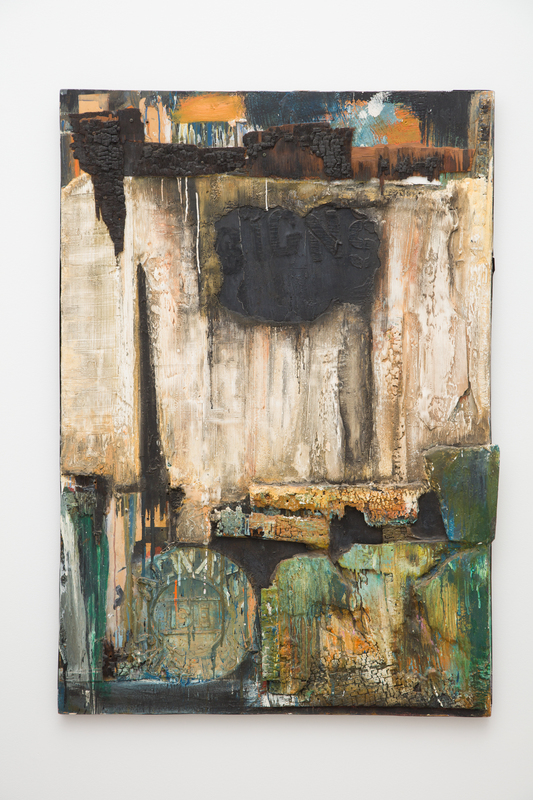 Several of Purifoy’s assemblage works made from Watts debris—including Watts Riot from 1966—are on display at the Broad museum right now as part of their new special exhibition Soul of a Nation: Art in the Age of Black Power 1963-1983. 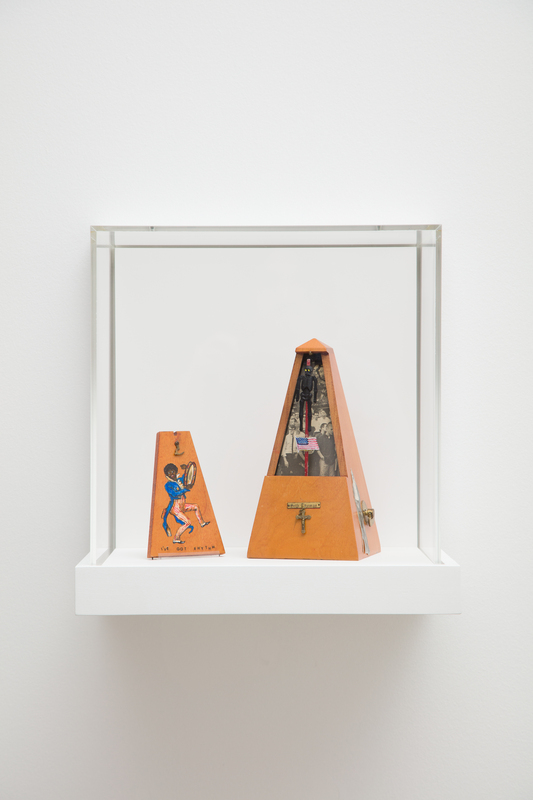 Presented alongside other powerful pieces like Betye Saar’s 1972 The Liberation of Aunt Jemima and three of Melvin Edwards’s Lynch Fragments, they offer viewers a crash course in mid-century Los Angeles assemblage art. At the heart of this rich and diverse exhibition is an attempt to correct the historical record. Soul of a Nation was originally presented by London’s Tate Modern in 2017 and has since traveled to the Crystal Bridges Museum of American Art in Arkansas and the Brooklyn Museum in New York. At the heart of this rich and diverse exhibition is an attempt to correct the historical record. Here Tate Modern curators Mark Godfrey and Zoé Whitley ask big questions and dig deep into the varied, significant contributions of black American artists during the 1960s and ‘70s. As they do so, they critique the long-accepted canon of art history that focuses primarily on the contributions of white male artists. Think about American art in the 1960s and ‘70s and names like Warhol and Lichtenstein might come to mind first. Upstairs at the Broad, where the museum’s permanent collection is on display, entire rooms are dedicated to each of those familiar artists. This exhibition will leave you wondering why David Hammons and Betye Saar don’t have rooms of their own upstairs, too. And why their names are not as well-known. The answer to that question, of course, is racism. 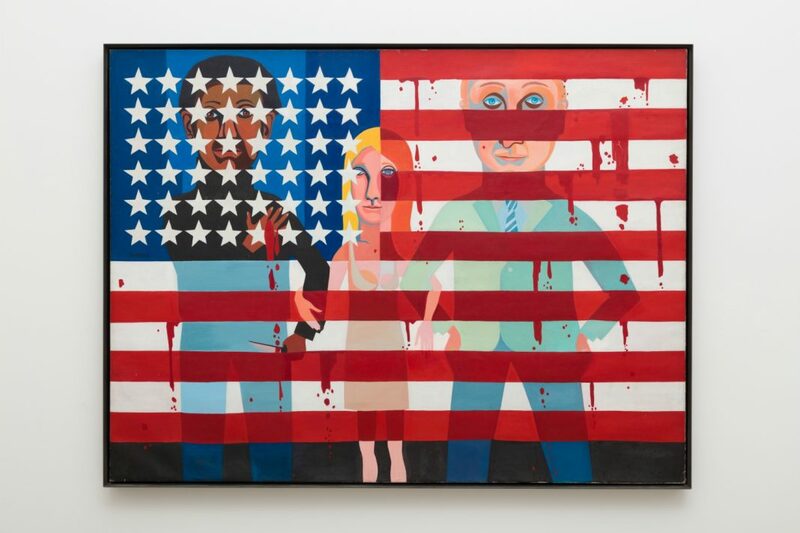 And racism, slavery, and oppression and the ways in which black artists have chosen to address those topics (or not) in their work are at the center of this show. Presented thematically across 12 thoughtfully organized groupings, Soul of a Nation explores black artist collectives from New York to Los Angeles. The art on display here is varied—from large-scale abstract works to intimate figurative paintings and photographs—and there is much to unpack. But the collective weight of the show is powerful, a rewarding examination of work that demands retroactive inclusion in the story of 20th-century American art history. The Broad’s founding director, Joanne Heyler, decided she wanted to bring Soul of a Nation to Los Angeles after seeing it in London, particularly because of how L.A. is featured within it. So many of this exhibition’s highlights are rooted in the West Coast, and those segments pack a particular punch in this version of the show. At the Broad, associate curator and exhibitions manager Sarah Loyer fleshed out the L.A.-based portions of the show, adding works borrowed from the California African American Museum, LACMA, and even one piece from Jay-Z and Beyoncé’s private collection (David Hammons’s Shine). In addition to the room dedicated to L.A. assemblage artists, two of the exhibit’s spaces recreate historical L.A. shows—LACMA’s 1971 exhibition Three Graphic Artists, which featured works by Charles White, David Hammons, and Timothy Washington, and California State University, Los Angeles’ 1973 survey of works by Betye Saar. Loyer says that in organizing those spaces, drawing on local resources was key. She worked closely with LACMA to borrow works by White not on display in that museum’s current retrospective of White. She also personally consulted with Saar to choose the wall color for the room featuring her works. Photographs of Saar’s 1973 show are all in black and white, so the wall color isn’t distinguishable. But Saar, who still lives and works in Los Angeles, could recall the exact shade by memory. David Hammons, The Door (Admissions Office) (1969), courtesy of the California African American Museum, Collection of Friends, the Foundation of the California African American Museum. 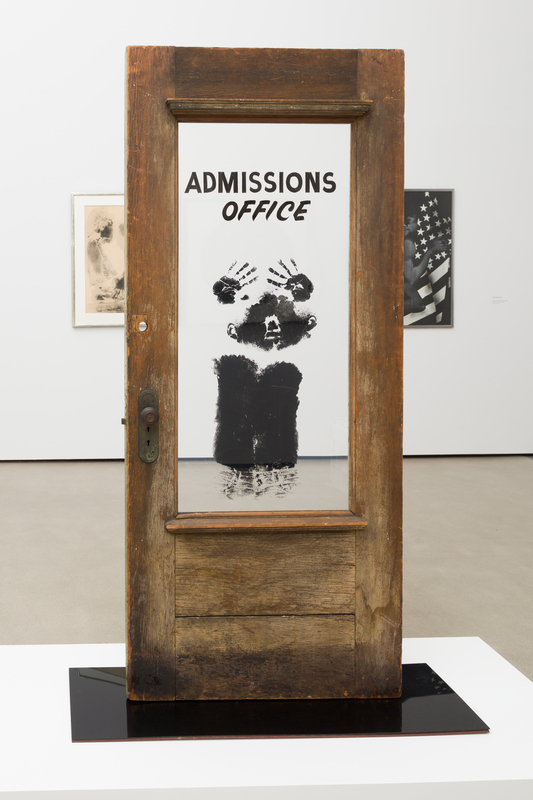 One poignant addition to this show which only appears in the L.A. version was borrowed from CAAM: David Hammons’ The Door: Admissions Office features the black imprint of the artist’s body smashed against a glass school admissions office door. Given recent college admissions scandals, the piece feels startlingly of-the-moment, questioning who gets in to schools and other powerful institutions, who doesn’t, and why. Loyer and her colleagues also supplemented Soul of a Nation with stellar programming, including a day-long symposium that coincides with the show’s opening on Saturday, March 23, an evening of music curated by Quincy Jones and Terrace Martin on June 1, and an exhibition called Time is Running Out of Time, presented at Art + Practice in Leimert Park through September 14. At the opening-day symposium, attendees will hear directly from artists featured in the show like Mel Edwards and Jae Jarrell, and filmmaker Ava DuVernay will appear in conversation with Ford Foundation President Darren Walker. Soul of a Nation is well-worth the $18 cost of admission ($12 for students and free for children under 17). It offers a chance to reconsider what you know about American art history and to discover new favorite artists. For tourists who come to the Broad from around the world, it presents a window into an important moment in American art history that has long been ignored. And for Angelenos, it provides context for our own art history and the chance to reconsider how we perceive it.